A tropical punch drink mix gives this punch its wild flavor—perfectly complemented by the down-home flavors of cherry and orange! Place drink mixes, basil, lemon slices and sugar in 5-qt. pitcher or punch bowl. Add water; stir until mixes are dissolved. Refrigerate several hours or until chilled. 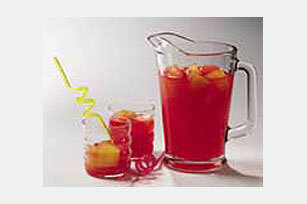 Prepare any flavor KOOL-AID Sugar-Sweetened Drink Mix or KOOL-AID Unsweetened Drink Mix as directed on package. Pour into plastic ice cube trays. Freeze until firm. Use to chill punch without diluting flavor. Omit sugar. Prepare as directed, using 3/4 cup of each flavor KOOL-AID Sugar-Sweetened Drink Mix.